This is one of the easiest tutorials I’ve every written. 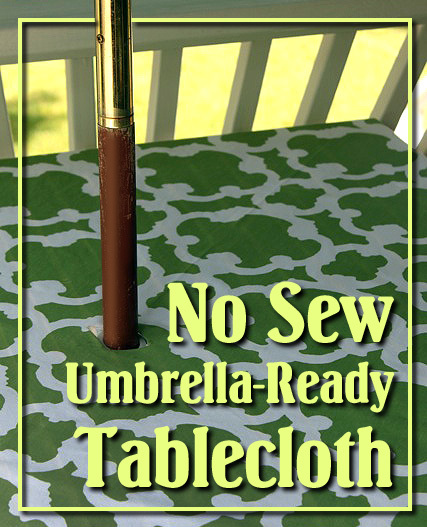 As a bonus, it is a no sew table cloth perfect for updating your outdoor table that has an umbrella. I didn’t win this time, but not because of the tablecloth. It was less than $20. Is there anyone that has won this game? Inquiring minds want to know! Fold the shower curtain into fourths to locate the middle. Cut a snip into the fabric at the center of the table cloth (corner of the folds). Open the shower curtain up and cut another slit perpendicular to the first. Fold the triangular flaps back and make sure there is enough clearance for the umbrella pole. Bring the shower curtain inside and pre-heat your iron according to the fusible tape’s directions. Cut small pieces of the fusible tape and line them up on the triangular tabs. 1. Iron the tape in place. 2. Peel off the backing from the fusible tape. 3. Open the flaps up. 4. Press the flaps open and melt the fusible web to glue the tabs open. Paint the edges of the tabs with the clear nail polish or fray check. Lay your new tablecloth over your table and feed the umbrella through the center hole. Enjoy! Don’t forget to enter to win a $100 Lowe’s gift card. And I will be judging the Before & After contest for One Project Closer later today, so link ’em up if you’ve given any room in your home a makeover! That’s another opportunity to win a $50 Lowe’s (or Home Depot) gift card or an Amazon gift card. Good luck! Check back next week to see the final reveal of my patio table facelift! It’s being transformed from drab to fab with just a few simple additions. You could have made it even easier by using a large grommet. Looks great on the table. Lisa, that’s a good point. Sadly, I don’t have a grommet maker, so did the best with what I had ;-). I’m loving that bright green pattern on the shower curtain – I may have to run out and snag it to make my own patio tablecloth. Let’s face it, it’s not like I’m going to win the under $100 challenge at Target any time soon! Will you let this sit in the weather, or are you removing it after each use? Megan, ours has been outside for several weeks now. I just leave the umbrella open which shields it from the rain. Every time I go out I just have to shake or brush a few specks of tree debris, etc. At the end of the season I’ll pull the umbrella out and remove the table cloth to wash it. Fantastic blog 🙂 You’re right, it’s super easy – I can’t sew to save my life but I could definitely do this! Great tip about the nail polish too, I would never have thought of that in a million years. Did you have to trim off one edge though where the shower clips/rings normally go? Isn’t there one edge full of holes? That turned out great – love the pattern and the colours too! I have this linked to my patios project roundup post as well today! Love this idea. I made a table cloth out of linen type shower curtains. I found I liked the fabric better than regular table linens. Except real linen of course. I did cut off the tabs and sew the edge. love this! thinking of snagging this idea for my patio cushions:) great! WOW!!!!!!!!! Thanks so much for this tutorial. I have been looking all over the place for a table cloth for our rectangle size patio table that has an umbrella. Not easy finding one with a hole in it. This was so helpful and not scary for someone like myself who doesn’t sew. You are welcome. Soon you’ll have a custom tablecloth! I am not a sew-er… Love your help for making the umbrella hole on a tablecloth… but here’s my issue. I live where it’s windy and need to close the umbrella when not in use. I just got an inexpensive tablecloth that I want to use with my table & umbrella. But if I leave the tablecloth on the table, the intense sun of my area will fade it in no time. Is there a way to get it on and off the table without having to lift the heavy 9′ umbrella out and put back every time? (I’ve seen zippered cloths… just want to do something easy that I can manage). Thanks for any ideas! Gail, I purchased one of the zipper oil cloth tablecloths with a zipper after this one faded. The oil cloth is definitely easier to remove and it doesn’t fade as fast. Tammy, if it’s thick vinyl, you can just cut it. If it’s thin you might need to reinforce around the hole.